So, you want to get into a rental apartment. After looking around you may feel overwhelmed, do you go for unfurnished or furnished apartments? With so many available options out there, it is hard to know what suits your needs. The best thing to do is understand the differences and pros and cons between unfurnished and furnished apartments. Apartments that are classified as unfurnished do not include furniture such as beds, couches or anything else. They may come ready with a fridge, stove, dishwasher and perhaps a washer and dryer combination. Furnished apartments come in a variety of choices. Some may be all inclusive and have everything you require from a bed, sofa, appliances and even plates and cutlery. These elaborate units may even have a housekeeper that cleans the apartment and washes the sheets and towels regularly. Interior designers are occasionally hired to decide on the furniture, artwork and other décor for furnished rentals. *Not all apartments are like that however, most furnished rentals may only have the bare necessities. Some just consist of a couch, bed, fridge, stove, TV, etc. Renting an unfurnished apartment allows you the freedom to decorate it any way you like. You can change the wall colors, add personalized artwork and pick out your own furnishings. At the same time, you do not have to be concerned with causing damage to the owner’s property. Moving into a furnished apartment means all you have to do is bring your clothes and personal stuff. No lugging up heavy furniture. You wouldn’t need to spend any time or additional money shopping for furniture-it is already there. 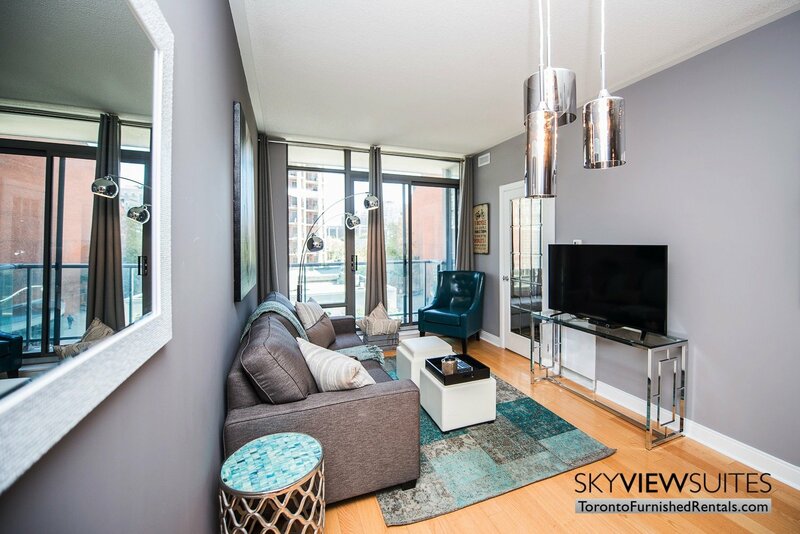 SkyViewSuites (www.torontofurnishedrentals.com) are convenient and move in ready. Unfurnished apartments can cause annoyance if you have no patience for furniture shopping, or have no idea how to decorate a place. Furnishing an apartment can cost a lot of money and bringing in bulky buys can be a bother to deal with. You would have to move everything in and then once your lease expires, you’d have to clear it all out. Furnished apartments cost more to rent because everything is already included. The furniture may not be your cup of tea, and has also been used by others. There is a possibility that something might get broken or dented, and if so, the renter is responsible. Now that you know all this it will be easier to make an informed decision.